Jacobs Ladder in Victoria Park, a good climb! A wooded park right in the centre of town, Victoria Park is a favourite place for locals to go for a stroll, swim or picnic. There are two big waterfalls, popular swimming holes in the summer. 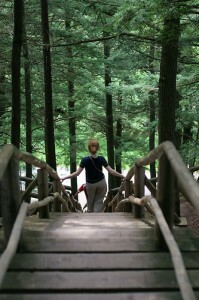 Jacob’s Ladder is a 175-step staircase that leads up to walking trails and a view over the falls. There’s also a playground for kids. It’s easy to spend a few hours exploring the park. Many people stop in Truro to watch the Tidal Bore roll in. The vantage point is just off Highway 102, beside the Palliser Motel. People from Truro joke that it’s called the tidal bore because the spectacle can be a bit underwhelming. During a new moon, the wave is barely more than a ripple. To see it, you’ll need to check what time the Tidal Bore arrives with a tourist office. If you’re left underwhelmed, try tidal bore rafting for a real adrenaline rush! There’s a good farmer’s market on Saturday mornings from mid-May to late October. You’ll find organic foods, baked goods, live music and crafts. The market is in Truro’s downtown area, just off Prince Street and about a 10 minute drive from the exits on Highway 102. All over town you’ll see sculptures of famous local figures. They’re carved from the trunks of Elm trees that were struck down with Dutch Elm disease – a major problem in Nova Scotia.